But a conversation within the bar on the Thursday night prompted a reminder of my first ever experience of writing film reviews, before this blog was even a glint in the milkman’s web browser. When I was at university, I ended up writing reviews for a film society at a friend’s university; while my first drafts were well received, said friend did point out that I’d been rather honest in some of my opinions, and while that was fine for Reservoir Dogs, they were a film society that relied on punters and I might still need to find the positives in Species. I find myself in the position of wanting to be honest about the films, but also in a position where I want to encourage people to visit the festival. I am just one person, though, and if anyone is truly making their decision about whether or not to see films based purely on my opinions, I suggest a quick re-evaluation of your life choices. Other reviewers are available. With that in mind, here’s my thoughts on the films of this year’s second day. I’ve rarely, if ever, seen Westerns at the cinema, but one of the first I did was Meek’s Cutoff, an excellent drama set in the Wild West (rather than a Western) that frustrated some audiences with the ambiguity of the ending; and when I say frustrated, at the end some people were still in their seats, asking “is that it”? 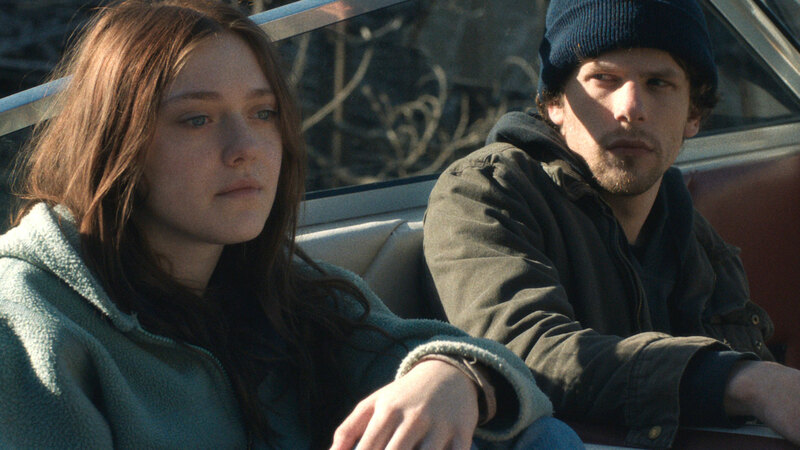 Night Moves also seems to have caused audiences some consternation if other online reviews are anything to go by, but Kelly Reichardt’s follow-up to Meek’s is actually an engrossing thriller set in the world of environmentalism. Three concerned environmentalists (Jesse Eisenberg, Dakota Fanning, Peter Sarsgaard) hatch a plot to blow up a hydroelectric dam that’s had a detrimental environmental impact. Setting about their task methodically, their efforts are undercut by Sarsgaard’s Harmon. Harmon has a laissez-faire attitude which adds moments of unnecessary jeopardy to their expedition; they are nothing to the unexpected consequences of their actions, which have dramatic ramifications. Possibly as a riposte to those critics who’ve made their minds up about him, never mind his books, Hoellebecq has taken the experience and, in working with writer / director Guillaume Nicloux, conjured up a documentary-style telling of the period of his real life disappearance during a book tour in 2011. Entirely a work of fiction (or is it? 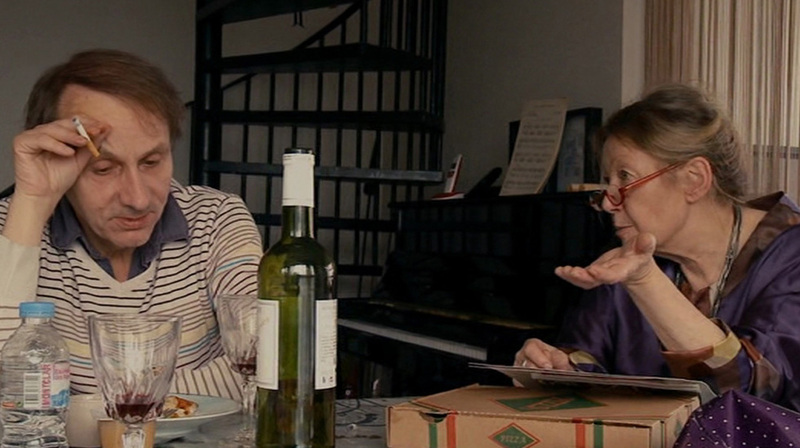 ), Houellebecq plays himself and winds up in the company of three brothers and their extended family. Learning body-building and having lengthy debates over dinner, Houellebecq’s excursion plays as a whimsical fantasy that just might be the nicest kidnapping in recorded history. It might not quite resonate as much with those in this country not familiar with the man – think the Agatha Christie episode of Doctor who, but without the aliens and with Salman Rushdie, and if that sounds daft then don’t worry, that’s the exact tone they’ve gone for – but it’s a pleasant enough diversion for ninety minutes. I have a significant advantage with A Most Wanted Man in that any concerns I might have had about my review damaging the audience in that the second festival screening has now passed, with me having taken so long to write up my review. But the film will be on general release in a few weeks, and has so far gathered significant critical acclaim, with the reviews including Alan Scherstuhl in Village Voice saying “A Most Wanted Man is simply a complex tale superbly told, with time for nuance and to soak in its mysteries” and Richard Roeper in the Chigaco Sun-Times saying that the film “… works as a crowd pleaser and a believable reflection of how these fictional events might play out in the real world.” On the other hand, Time Out New York described it as a “disappointing plod of an espionage thriller”, the San Francisco Chronicle suggests what we should take is that “it’s really boring – practically sleep inducing – to be an international spy” and Elizabeth Weitzman in the New York Daily News went further, saying it was “so slow I can feel my hair growing”. You may have guessed that I’m in the latter category. There’s some interesting themes here, certainly the idea of a spy organisation with a conscience but one that’s also looking at the bigger picture is intriguing. 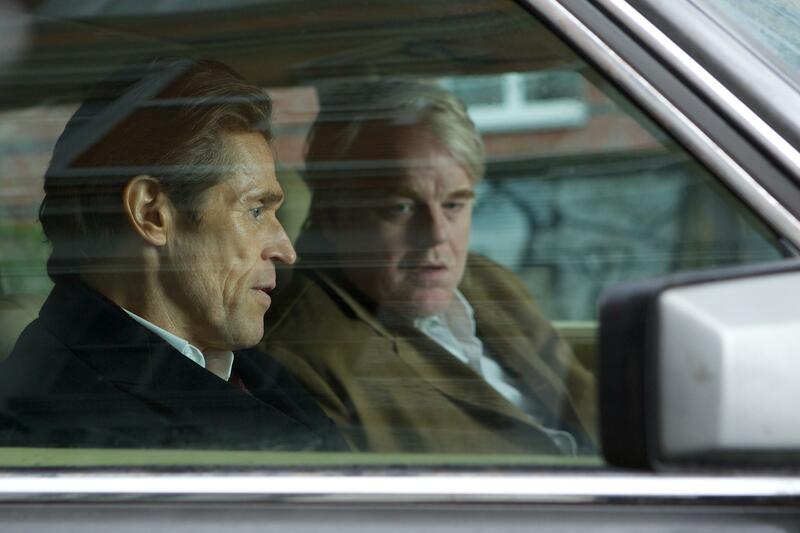 Philip Seymour Hoffman is as magnetic as ever, even if he rarely has to engage his acting muscles, and stronger than usual female roles for Nina Hoss and Rachel McAdams (even if neither gets anything much to do either). There are also massive wastes of talent going on, from Willem Dafoe to a spectacularly unused Daniel Brühl, but the fundamental flaw (and almost the polar opposite to Night Moves) is that this is a thriller without any thrills. It’s barely got a pulse and by the time it gets into second gear it’s almost at the final scene. Thankfully there are much better films which will pay testament to the true abilities of Hoffman. The day finished off with the first in the Retro 3D season, a loving restoration of the classic Vincent Price movie from 1953. The film opened with an introduction from Ramon Lamarca, who also curates the Catalan season at the festival, and helped to put into context the film’s position in the history of this particular subset of the medium. House Of Wax was the first colour 3D film from a major American studio, and was distributed and projected using the polarisation method we currently use to watch 3D films in cinemas (as opposed to the multi-coloured glasses of more recent decades). 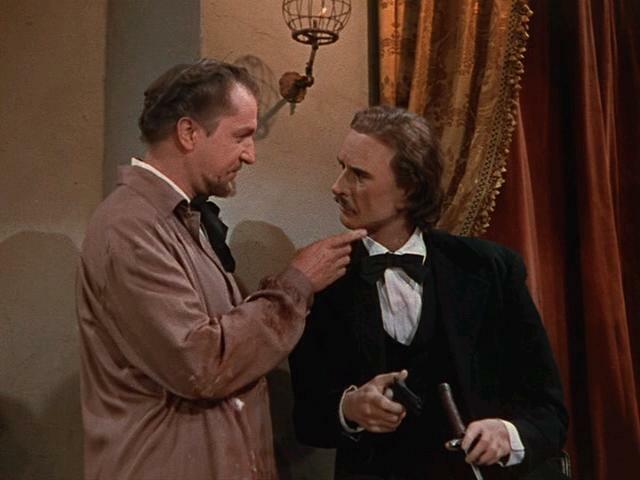 It made Vincent Price into a big name once again, the story of a man whose waxwork museum is burned to the ground in an insurance fire with him in it, and how he then exacts a heavy toll on those who have wronged him. Having not seen the film before, what most surprised me was the structure; after an intermission card (which caused some people to start to leave their seats in an almost Pavlovian fashion), the new House Of Wax is introduced by a showman, and some of the most obvious “throw things at your face 3D” – all of which is entirely coincidental to the film’s plot – take place over the next ten minutes. It’s all thoroughly enjoyable, the 3D just adding to the fun, and it’s not hard to see why this had such a restorative effect on Price’s career. There’s generally a lower presence of horror at this year’s festival, but House Of Wax was a delightful Friday night treat. This entry was posted in Cambridge Film Festival, Reviews and tagged 2014, A Most Wanted Man, Cambridge Film Festival, film, House Of Wax, movies, Night Moves, review, The Kidnapping Of Michel Houellebecq.